Eating sweets will make a green tea even more delicious, so we usually finish eating sweets before drinking powdered green tea. Then, the taste of the tea will be milder. Actually, we have 2 kinds of powdered green tea. Koicha: a thicker tea and Usucha: a light tea. Thick tea is 3 times stronger than the light one. When we have Koicha, it usually has big fresh sweets made of bean paste, sugar, or sometimes agar or powdered glutinous rice and etc. It contains over 30% water, so we need to finish eating them within a day. When we have a light tea, it usually has dried small sweets which will last longer. Both fresh and dried sweets reflect the seasons in Japan. In Koto, I serve dried sweets or half dried sweets in the shared session, and you can try special fresh sweets in the private tea ceremonies.I would like to introduce 6 kinds of fresh sweets in this blog. 1, Joyo: You can eat them by hands while we usually use small knife to eat others kinds of fresh sweets. Joyo means Japanese yam, which is used to make glutinous rice or wheat flours stick together. The dough covering the small bean ball is the moist and smooth. It is said that Joyo is the most simple fresh sweets from which we can feel the taste or characters of the sweets shops. 2, Kinton: The shape is like the chestnut in burrs. A small bean ball is covered with minced bean pastes. The shape will be changed by how finely they strain the bean pastes.Even the shape is almost the same and the color will be changing according to the seasons. What is this? Don’t you think it is artistic and stretching your imagination? The guests will ask the name and the makers of the sweets in a tea ceremony because they are sometimes looking forward to hearing the beautiful name to feel seasons. 3,Nerikiri: mixed with white beans, boiled glutinous rice and sugar, and create the shape by hands or wooden mold. 4,Konashi: It is similar to Nerikiri, but one more step to steam we need for Konashi. Steam the wheat flour mixed with white bean pastes, and adjusts the hardness by adding the syrup. 5,Uirou: It is made of rice powder, glutinous rice powder, and sugar. color, steam them and create the shape. The taste is similar to rice cake, but Uiro is softer and moister than rice cakes. The name of Uiro came from Kamakura period(1185〜1333). A medicine salesman at that time was selling the sweets to relieve the bitterness of the medicine. The name of the sweet was Uiro. 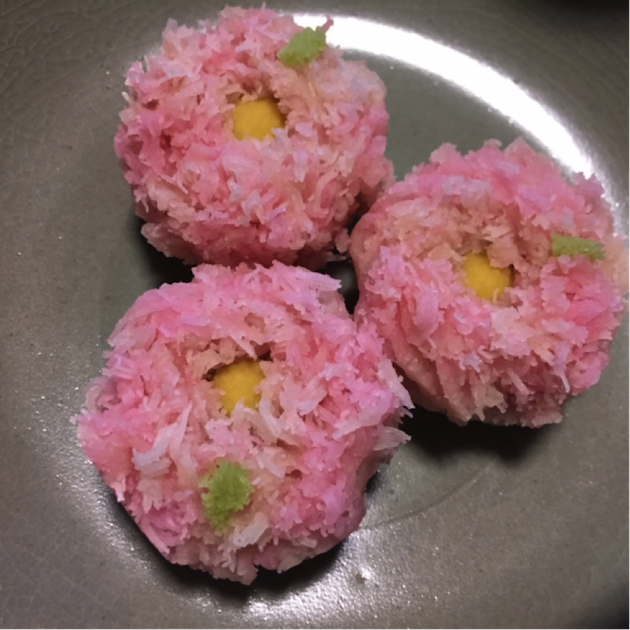 6,Kingyokukan: It’s the best sweets for summer. It is made of sugar, agar, and glutinous starch syrup. We see the transparent agar as cold water, where we often put in some goldfish or summer scenery in Kyoto. We have some kinds of Japanese dried sweets. 1, Kakemono: Kake means dusting sugar. Mono means thing. Beans or small balls made of glutinous rice called Arare are covered with sugar. 2, Uchimono: Uchi means striking or hitting. Make the dough with rice powder, soybean flour, or roasted wheat powdered and make their shape into wooden pattern. 3, Oshimono: Oshi means pushing. Mix the bean paste into the ingredient of Uchimono, and make the shape by pushing into the wooden pattern. It contains water more than Uchimono. 4,Amemono: Ame means candy. Simmer the starch syrup and cool them after. 5,Yakimono: Yaki means baking. Bake the dough made of rice powder or wheat powder. You can buy Japanese fresh sweets in the department store or many sweets shops or cafes in Kyoto. But it will be a different experience to have sweets in a tea ceremony because it is not just drinking and eating in a tea room. Tea ceremony is the comprehensive art including tea utensils, calligraphy, flowers, incense and etc. 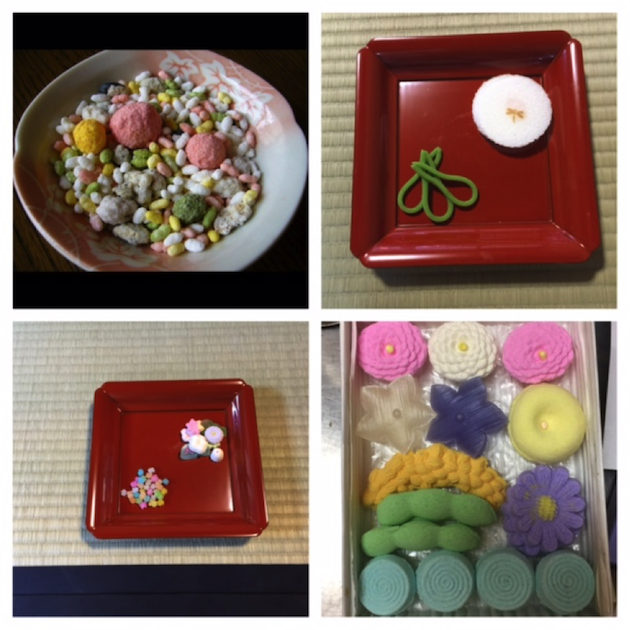 What’s the difference between sweets for tea ceremony and daily life? Eating sweets will make a green tea even more delicious. So we choose the natural taste and touch which does not have too strong smell or color made of traditional natural ingredient such as beans, rice powder, and sugar, not use oil or butter. It is likened to a tuxedo or evening dress if we talk about dress. In addition, reflecting seasons is the most important for tea ceremony. Seeing the designs, we imagine what they are, and feel the seasons. It is sometimes said that too strait design is not appropriate for tea ceremony. We like to imagine from the abstract designs. For daily life, we have pretty Japanese sweets with strong colors and taste, which are also tasty. Maybe a lot of children like this kind of sweets, which are sometimes used very casually in tea ceremonies.Koto serves traditional sweets made by a shop of long standing in Kyoto, “Senbon tamajyuken”, which keep making sweets especially for tea ceremony. 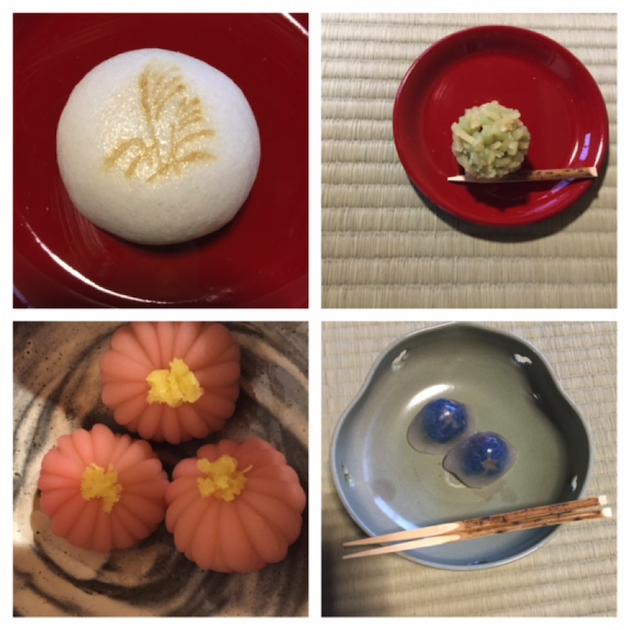 Their special fresh sweets are served in real tea ceremonies in Kyoto. 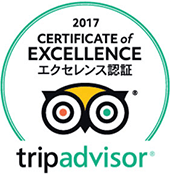 I would like you to feel the best combination of high qualified powdered green tea and Japanese traditional sweets.You do not need to wear special tuxedo or evening dress to come here. Kyoto welcomes tourists and beginners!